When I was in my twenties, going for buffet is a piece of cake. I can easily have a few servings (hehe to make my money worth). As I aged, my food consumption became lesser and lesser. Thus these days, going for buffet is just a waste of money for me. I rather go for ala carte and that is. Then again, sometime it is the company that matters as well. Each hotel will have their owned specialty. 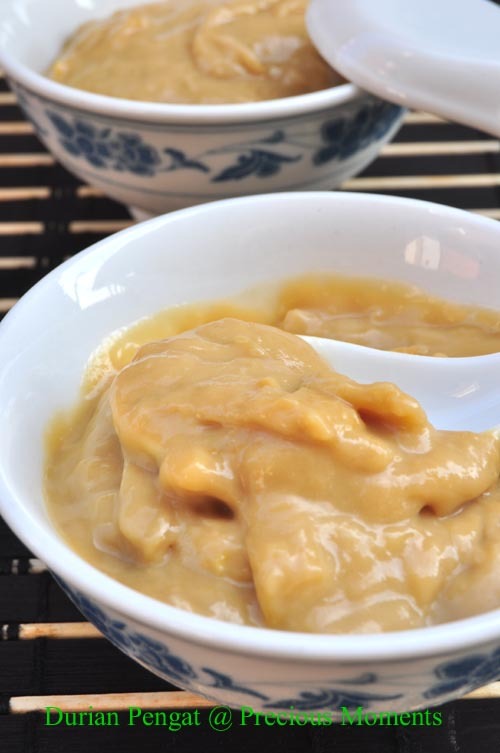 If you frequent buffet, you will know one particular hotel is famous for its Durian Pengat. I fell in love with it the very first time I tasted it but I haven't done this dessert for the longest time. Don't ask me why but suddenly I craved for it. I shared this with my contractor and his staff and all gave a thumbs-up. My sister right away commented that it is as good as the 5 star version. If you are like me and love this dessert, give this a try. I am sure you won't regret. I’m submitting this post to Aspiring Bakers #201 : Asian dessert buffet! (June 2012) hosted by Moon of Food Playground. Puree the durian pulp for a smooth texter. Place thin coconut milk, milk, chopped gula melaka and pandan leaves in a pot. Slowly simmer at lower heat and stir till gula melaka melted. Add in durian puree and stir till well incorporated. Add in thick coconut milk and stir till combined. You can add more milk or coconut milk if you like a thinner consistency.